then decayed into an atom of bohrium-262. whose chemistry has not been tested. has a half-life of 7.6 seconds. would be impractical or impossible. if I were sufficiently practical. if I didn’t dislike exercise. 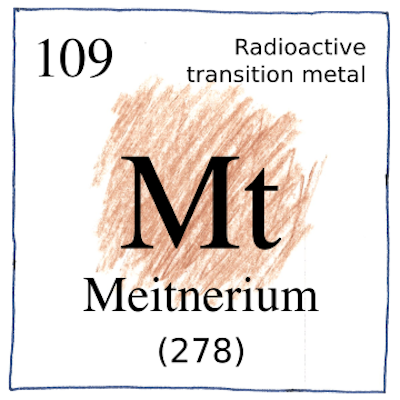 The math for the production and decay of the first meitnerium is simple arithmetic. Bismuth-209 plus iron-58 minus one neutron equals meitnerium-266. Meitnerium-266 minus one alpha emission is bohrium-262, since an alpha emission is one helium nucleus (two protons and two neutrons).